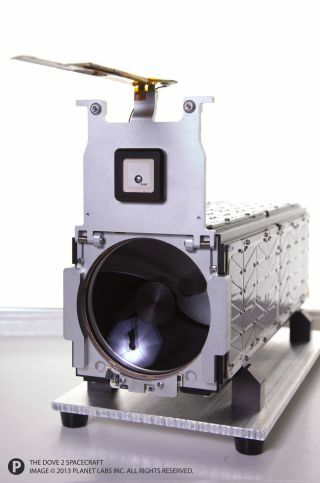 A close-up of Planet Labs' Dove 2 Earth-imaging cubesat, which launched to orbit in April 2013. The tiny satellites that could change the way humanity views and monitors its home planet are getting their first close-up. Planet Labs has released photos of its Dove line of spacecraft, 28 of which the San Francisco-based startup plans to launch a few months from now to form the world's largest constellation of Earth-observing satellites. This image shows one of the first photos of Earth taken by the small Dove 1 satellite on April 24, 2013 during a satellite test flight by Planet Labs, Inc. of San Francisco, Calif.
Dove 1 and Dove 2 launched two days apart this past April, with Dove 2 hitching a ride on a Russian Soyuz rocket and its sister spacecraft getting to orbit on the first flight of the Antares rocket, which aerospace firm Orbital Sciences Corp. built to make robotic cargo runs to the International Space Station for NASA. Both Dove 1 and 2 were tiny, measuring just 12 inches long by 4 inches wide by 4 inches tall (30 by 10 by 10 centimeters), yet both beamed home sharp images of Earth's surface. Dove 1 burned up in the atmosphere after less than a week on orbit because of the low altitude of the Antares test flight, but Dove 2 is still zipping around the planet. Prototypes of the tiny (12 by 4 by 4 inches) Dove satellite built by the San Francisco-based company Planet Labs. The Doves that make up Flock 1 will piggyback on Antares' first launch toward the space station, which may come as early as December. The constellation was designed to enable frequent, high-resolution and low-cost imagery of the globe that could benefit humanity in a number of ways, Planet Labs officials have said. "To best enable this mission, the company has selected a low orbit for its constellation and an optical resolution of three to five meters — a scale that allows measurement of a tree canopy, but does not compromise individual privacy," officials wrote in a June 26 statement announcing the Flock 1 project. "This will enable monitoring of deforestation, help improve agricultural yields, track natural disasters and many other applications." "The Blue Marble is a photograph of Earth taken by Apollo 17 astronauts in 1972 and is credited with popularizing the environmental movement. What the Blue Marble did for global awareness, Planet Labs will do for global action." Planet Labs' three co-founders — Chris Boshuizen, Will Marshall and Robbie Schingler — all previously worked on small-satellite projects at NASA's Ames Research Center in Moffett Field, Calif. Boshuizen and Marsall, for example, started and led Ames' PhoneSat project, which uses off-the-shelf cell phones as the control system for tiny satellites. Three PhoneSats launched to orbit in April along with Dove 1 on Antares' maiden flight.